Since 2004, we are providing professional service of high quality nonalcoholic refreshment in a stylish execution under the brand Cajomir comfort. Through an attractive, fun and educating form we are introducing the world of tea in its many forms. Lately we have added into out offer warm and cold food focusing on high quality ingredients, completed by specialities with tea. NEW. 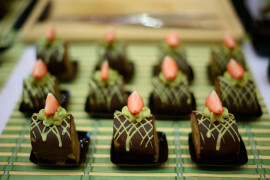 Many do not know yet, that tea is not only for drinking but is also used to make untraditional desserts. Cajomir catering provides you with tailor-made refreshment for small and big events. We are focusing on food from healthy veggie cuisine, combined with specialities from real tea. Tea does not have to be only a hot drink served in traditional porcelain cups. Try and enjoy high quality tea prepared as a cocktail. Thanks to traditional method of leaving to infuse while cold, we are able to create dozens of original tastes. It will address you through its attractive scale of colours and boosting effects. In an interestingly educating way we will guide you through the world of tea. 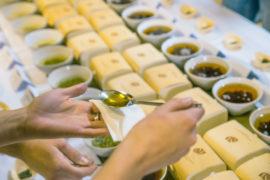 You can select degustation based on different areas China, Japan, Taiwan, Korea, India, or based on the method of processing the tea after collection. 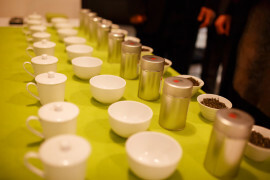 Guests will be taught the basics of taste recognition and they can also get a certificate from the Tea school in Kampa. Imagine a luxury wooden tea table lined with nacre. Behind it is sitting a tea mister and prepares tea of the highest quality in a stylish and elegant way. Every moment he is ready to serve different infusions of the most tasty teas and you can freely taste it for several hours. 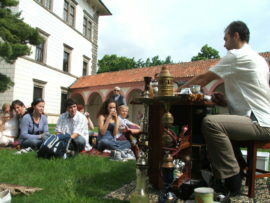 Guests will learn how to drink tea in a traditional way. You can include tea preparation education into the program of your company or private activities. We prepare individual programs where adults and children can join. You will learn many interesting advices and tips, that can nicely inspire you. The smell of fruit tobacco for shishas, strong coffee and sweet baklawa desserts, stylish furniture, colourful clothes, tiny decorations and costumes - we will make your office into a cozy Egyptian coffee shop with stylish services. 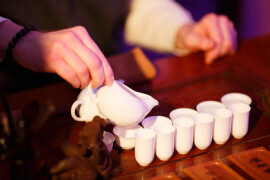 Tea ceremony creates an unforgettable atmosphere of harmony and relaxation. It is a tradition from Korea, concentrated in a perfect preparation of a cup of tea. It can be enjoyed as a fun small event for smaller groups or as an annotated performance on the stage. 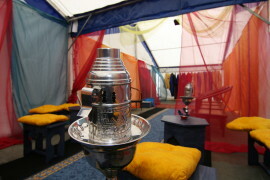 We are offering high quality services for outdoors events. At your festival we will make a teahouse as a nonalcoholic refreshing place with high quality beverages, shishas and vegetarian food.